Every time I travel somewhere new, aside from sharing my adventures, travel tips and the interesting foods I eat I also enjoy sharing with you where I get to stay. From sketchy hostels to the best hostels in the world, to sketchy hotels on the outskirts of Rome to the highest of luxury in South Africa. To me personally a good hotel room and bed to sleep in, although it’s not everything, can definitely make or break a trip. 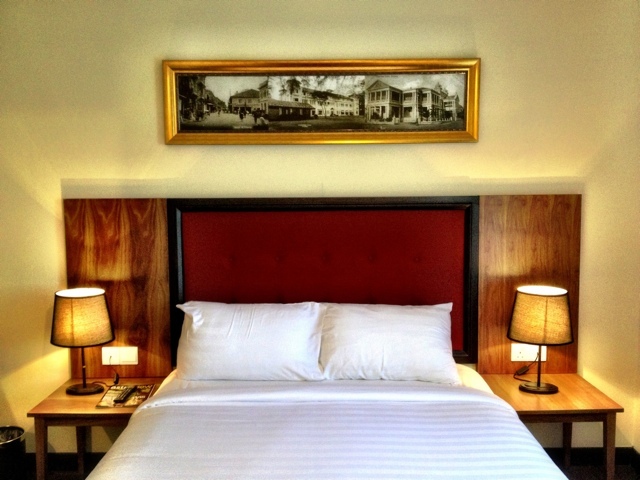 Today in my “Where She Stayed” series I bring you a lovely hotel that I stayed in, in the city of Georgetown, on the island of Penang in Malaysia. Looking for an affordable, comfortable, modern and centrally located place to stay when visiting the island of Penang in Malaysia? 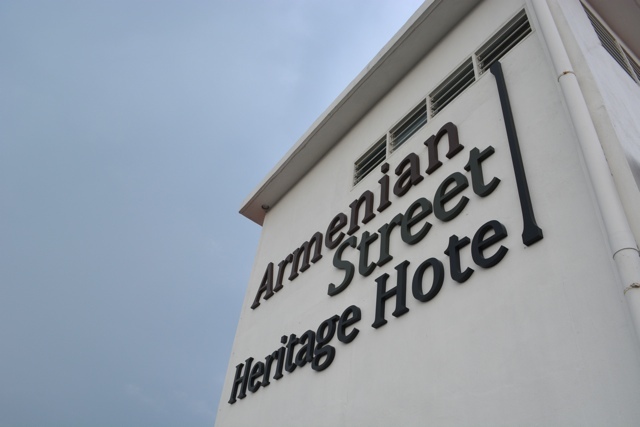 (Gotta love those buzzwords) I highly recommend that you check out the Armenian Street Heritage Hotel, located in the UNESCO World Cultural Heritage area of the city of Georgetown. If you are looking for a spa or beach accommodation this isn’t the place for you (although Penang is small so the beach isn’t too far away). However this hotel is perfect if you are wanting to scour the streets for interesting street art, or eat some of the very best food from the many hawker stalls nearby. 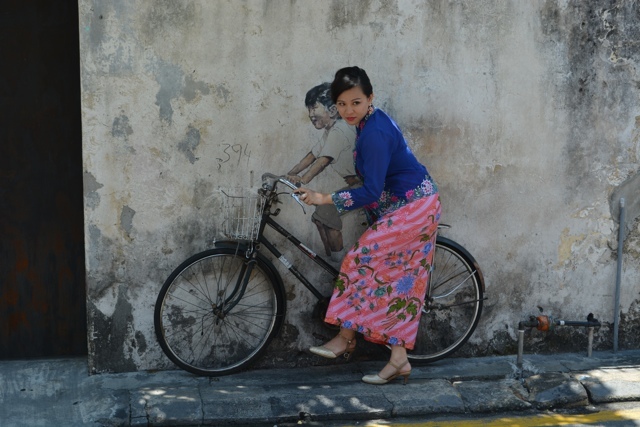 A model poses next to the “Kids on a Bicycle” 3D street art on display in Georgetown by Lithuanian artist Ernest Zacharevic. While in Penang I had the chance to stay here for two nights and it was a perfect location. Exit the door and around the corner to the right and you are in the heart of the UNESCO area of Georgetown where you can get lost roaming the streets for hours in search of all of the city’s interesting street art. Myself and my friend Raymond spent a full day doing just this and you can see more of my photos HERE. However you might want to avoid going there at the hottest time of the year like I did. Possibly avoid traveling there in April unless you like turning to mush and sweating to death. 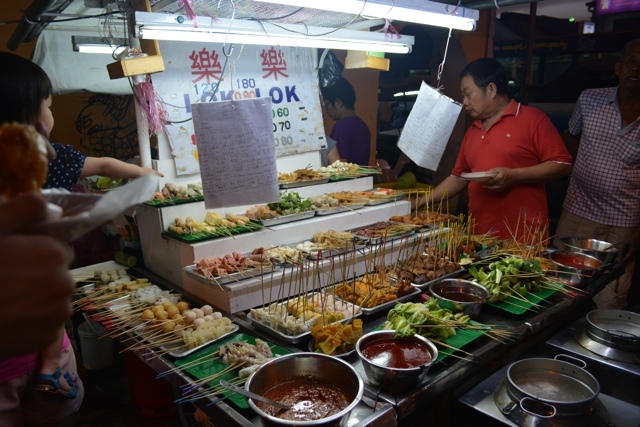 Delicious Penang street food – Penang is said to be the foodie centre of all of Malaysia. If you exit the hotel and head to the left you will find a few Hawker stalls on the street bunched together that share an indoor space with tables to dine at. I highly recommend getting the Char Kway Teow from these guys. Delicious! If you are looking for a few more options than what these stalls have to offer not to far on foot or close by in a cab is the street Lebuh Chulia where there are a bunch of hawker stalls right in the street that have tables set up outside along an alleyway. These stalls pretty much have every kind of Malaysian food you can ask for, cold tiger beers, delicious fruit juices and more. To see a quick tour of my room at the Armenian Street Heritage Hotel click play on the video. Special thanks to the Armenian Street Heritage Hotel for hosting my stay, as always all opinions and views expressed are my own. This hotel seems to be the perfect accompaniment for the foodie capital of the world. I love that place so much, many great meals were had when I was there!